Apparently, much better than the film! Sherman McCoy is a WASP, bond trader and self-appointed 'Master of the Universe'. He has a fashionable wife, a Park Avenue apartment and a Southern mistress. His spectacular fall begins the moment he is involved in a hit-and-run accident in the Bronx. Prosecutors, newspaper hacks, politicians and clergy close in on him, determined to bring him down. 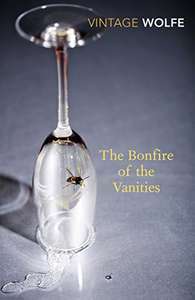 Exuberant, scandalous and exceptionally discerning, The Bonfire of the Vanities was Tom Wolfe's first venture into fiction and cemented his reputation as the foremost chronicler of his age. Loved this when it came out, not sure how it will have aged though, hopefully better than red braces and padded shoulders, but bought it for another read. Thanks OP. Film was a shocker compared to the book as I recall. IMO This really is his best novel. A bargain.